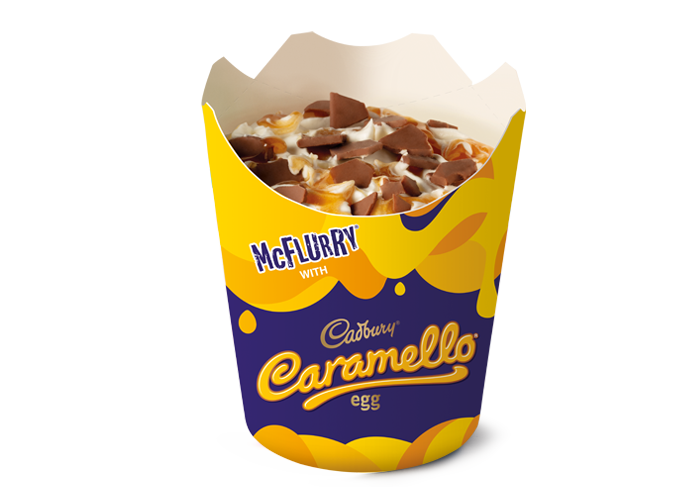 Delicious pieces of gooey CADBURY CARAMELLO sauce with CADBURY chocolate egg pieces. Available after 10.30am. Serving suggestion. CADBURY, CARAMELLO AND THE COLOUR PURPLE ARE TRADE MARKS OF MONDELĒZ INTERNATIONAL GROUP USED WITH PERMISSION. SUNDAE MIX: Milk, Sugar, Cream, Milk Solids, Glucose Syrup (derived from maize) Vegetable Gums (412, 407, 407, 466), Emulsifiers (471, 433), Flavour.CHOC PAVING PIECES: Full Cream Milk, Sugar, Cocoa Mass, Cocoa Butter, Milk Solids, Vegetable Oil, Emulsifier (442), Flavours.TOPPING CARAMELLO: Sugar, Water, Glucose Syrup, Condensed Milk , Thickener (1442), Colour (150), Food Acids (270, 330),Salt, Vegetable Gum (415), Preservative (202), Flavouring (Natural), Mineral Salt (339).Contains milk & sulphites. May contain TRACES of gluten, peanuts, soybeans & tree nuts.